In 1938 the American physicist and inventor Chester Carlson (1906-1968) (see the nearby image) invented a dry printing process, called later Xerography (the word comes from the Greek for dry writing), the foundation technology for copiers and laser printers to come. Carlson applied for patent in 1939 and in 1942 the patent was granted (US patent 2297691). 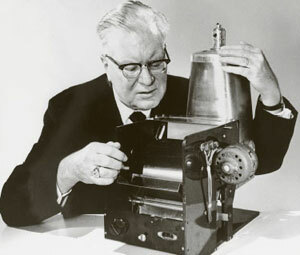 After several years unsuccessful attempts to catch the interest of companies to his invention, in 1947 Carlson succeeded to negotiate commercial rights to his invention to Haloid Company (later renamed Xerox). This was the deal of the life not only for Carlson, but also for the completely unknown company Haloid, which will become one of biggest companies in the world due to this invention. In 1967 a young researcher in Xerox's Webster Research Center in Rochester, Gary Keith Starkweather (born 9 Jan. 1938), B.S. in Physics from Michigan State University in 1960, and a M.S. in Optics from the University of Rochester in 1966, was sitting in his lab looking at all of these big mainframes when he started thinking: What if, instead of copying someone else's original, which is what a facsimile does, we used a computer to generate the original? And so the idea of the laser printer was born. In this times the lasers were rather expensive devices, but convinced that the cost of lasers would drop over time and that there was a market for laser printing technology, Starkweather stuck to his guns. His ideas however were met with major resistance from Xerox management. Starkweather was told by his bosses to stop working on the laser printer project. But he couldn't. He had to go through with this idea. He ended up working on it covertly, convincing people to get different parts for him so he could build it. The prototype was ready in 1969, built by modifying an existing xerographic copier. Starkweather disabled the imaging system and created a spinning drum with 8 mirrored sides, with a laser focused on the drum. Light from the laser would bounce off the spinning drum, sweeping across the page as it traveled through the copier. The hardware was completed in just a week or two, but the computer interface and software took almost 3 months to complete. The time has shown that Xerox management was wrong in that assumption: Printers now are a pillar of the company's growth strategy. Indeed, Starkweather's drive to create the laser printer eventually transformed a small copier company into one of the world's imaging powerhouses,and revolutionized the computer printing industry. 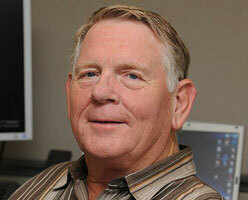 Salvation for Starkweather came in 1970 when Xerox build the Palo Alto Research Center (PARC) in California. Starkweather called PARC and was welcomed, his project appeared to be a natural fit into their long-range plans. Out of hostile territory and finally given the freedom to conduct his research without fear of retribution, Starkweather went to work on building the laser printer. In 1971, just nine months after joining PARC, Starkweather completed the first working laser printer. He named this machine SLOT, an acronym for Scanned Laser Output Terminal. The digital control system and character generator for the printer were developed by Butler Lampson and Ronald Rider in 1972. The combined efforts resulted in a printer named EARS (Ethernet, Alto, Research character generator, Scanned laser output terminal). The EARS printer was used with the Alto computer system network and subsequently became the Xerox 9700 laser printing system. Gradually the things took off, and by 1973 Starkweather's group had working models of this thing at the facility. The final result—the Xerox 9700 (see the lower image), introduced in 1977, was the industry's first commercial laser printer. It was a wild success, despite projections that few customers would produce the 200000 to 300000 prints per month needed for the unit to be profitable. Fresh off the success of the 9700, Starkweather shifted his research onto personal laser printers,and again ran into opposition from Xerox. 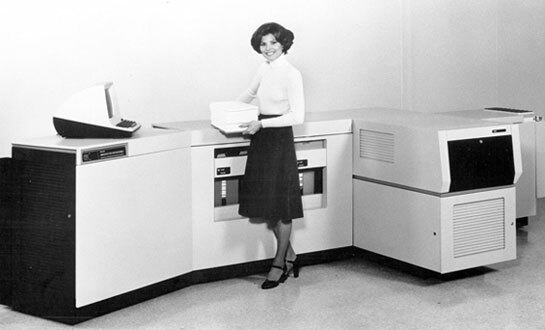 Xerox was a company that liked large, fast laser printers. They saw departmental units as the profit center for laser printer technology. Xerox failed to connect the dots and realize that the profit wasn't in the printer but in the toner and the paper. As a result, the company was beaten to market by Hewlett-Packard, which introduced the first personal laser printer in 1980. Xerox had an interesting capability that has always been characteristic of the company, and that is that it always encouraged new ideas but never really liked to pursue them for very long. Things like Postscript, the laser printer, the personal computer, the bitmapped screen, the iconic interface, Ethernet, packet switching, all of this came out of PARC. And none of it, ended up as a product of Xerox. Starkweather did see the writing on the wall at Xerox, however, and left the company in 1987 after 24 years of service. Following a 10-year stint at Apple Computer, Starkweather joined Microsoft Research in 1997. These days, his main area of research is display technology.